"These are light on curry but flavorful, and a nice change of pace when you're tired of the same old cookout fare." In a large, shallow dish, mix the mayonnaise, garlic, curry powder, chili powder, and ginger. Place the chicken in the mixture, and stir to coat. Cover, and refrigerate for 2 to 4 hours. 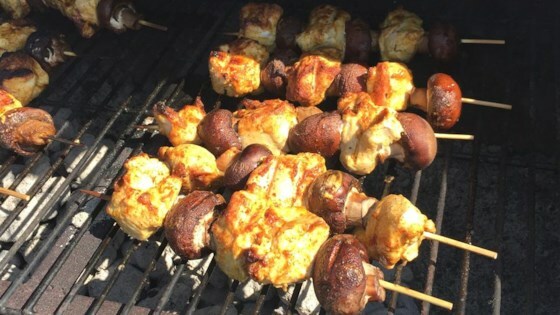 Discard marinade, and thread chicken pieces and mushrooms onto skewers. In a saucepan, bring the rice and water to a boil. Reduce heat to low, cover, and simmer 20 minutes, or until rice is tender. Lightly oil the grill grate. Grill skewers, turning often, for 5 to 10 minutes, or until chicken juices run clear. In a small bowl, toss together the tomato and onions. Serve the grilled chicken and mushrooms over rice. Top with the onions and tomatoes. Tender, juicy, grilled chicken skewers with Mexican-inspired flavors. GREAT RECIPE! I DIDN'T MAKE KABOBS, JUST MARINATED THE CHICKEN BREASTS AND THEN GRILLED. THIS IS A KEEPER! THANKS, AURIE. The ingredients sounded strange, but it was really delicious. I used regular mayo. I served it with saffron rice, and some nan bread. I didn't have curry , so I used garam masala, and the flavor was somewhat different. The mayonnaise made the meat very moist. We enjoyed it! Great recipe. I also used it with pork tenderloin. The meat was quite tender. This is a nice marinade. My husband suggested lemon juice to enhance the flavor, so I will that a shot tonight! Thanks so much for a great recipe! This was easy and pretty good. I used whole chicken breasts instead of Kabobs. The flavor was not quite as strong as I hoped for. My kids loved it.